I won! I am very honoured to have received this award. The list of nominees was full of friends and collaborators for whom I have an enormous amount of respect. Congratulations are due to my fellow nominees Jacqueline Block, Jenna Maren, Anthony MacMahon, Adam Naismith, Anna Seibel, and Aaron Shingoose – as well as to all the other nominees and recipients. 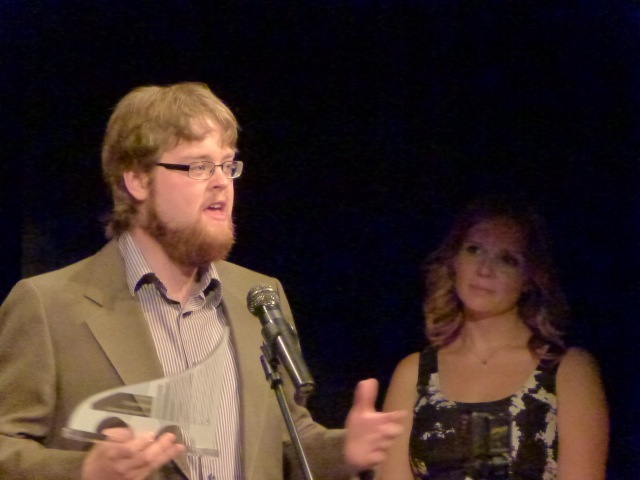 The ceremony was full of energy and enthusiasm for Saskatoon theatre. Here’s to keeping that momentum going, and to continuing to support emerging artists like myself as we all journey together telling stories! Posted on October 2, 2013, in SATAwards, xyetheatre and tagged awards, thanks!. Bookmark the permalink. Leave a comment.